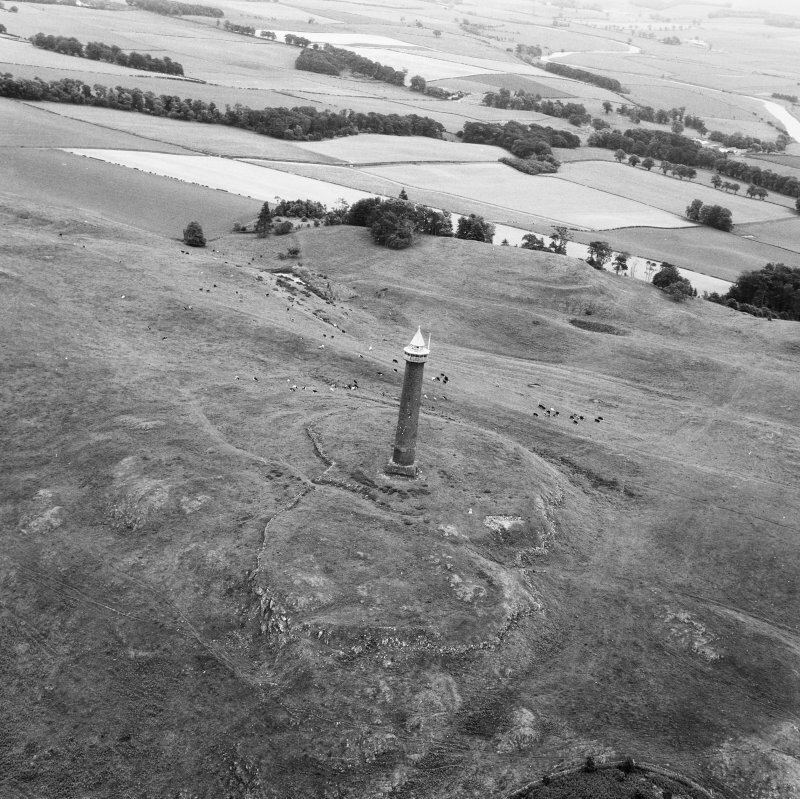 Oblique aerial view of the fort and monument, looking N.
(NT 6535 2630) Fort (NR). 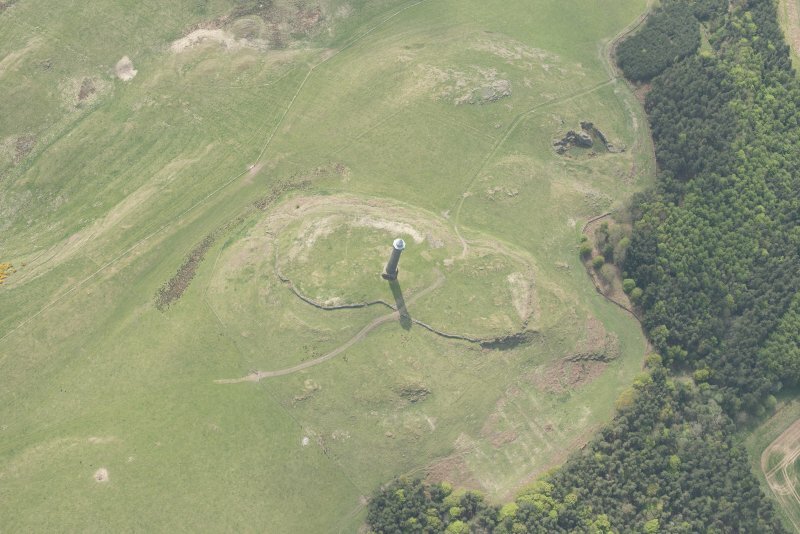 Fort, Peniel Heugh. 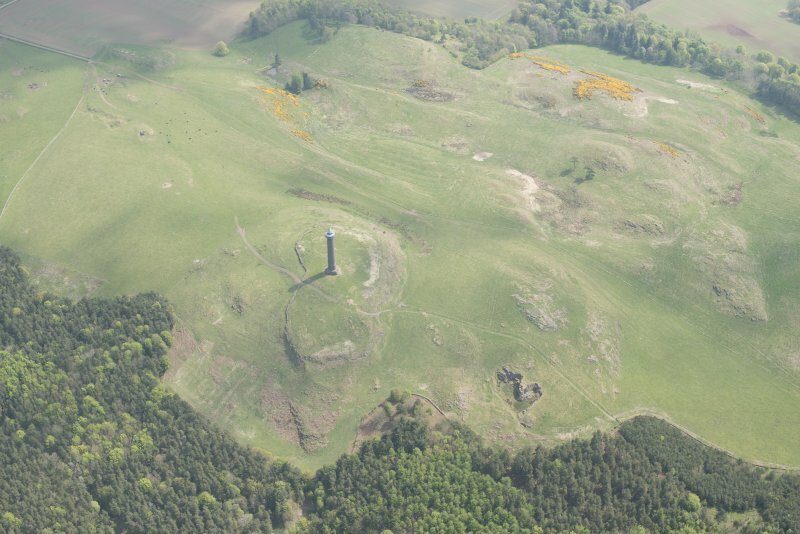 On the broad ridge that forms the summit of Peniel Heugh, a massive, isolated hill a mile and a quarter NW of Nisbet, there are the remains of two forts, one of which has been for the most part superimposed on the other (see plan, fig.163). The N side of the ridge is only gently inclined and merges imperceptibly with the main plateau, but the other three sides rise steeply to a height of from 20ft to 30ft above the base and, on the S and W, are broken by rock outcrops. 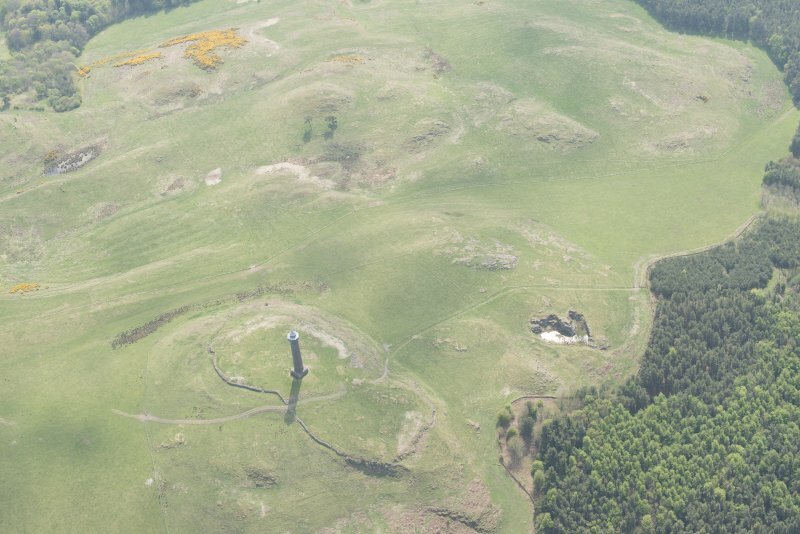 From the summit (781ft OD), which is crowned by a tower, 150ft high, erected in commemoration of the battle of Waterloo, there is an extensive view of Teviotdale and Tweeddale to the W, and N, the Merse to the E, and the Cheviot range to the S. The older of the two forts lies with its main axis at an angle of 45 degrees to that of the ridge and encloses not only the higher (E) half of this feature but also part of the N flank. Although it has been largely destroyed in the succeeding phase of occupation, sufficient remains to show that it was approximately oval on plan and measured some 350ft from NE to SW by 270ft transversely within double concentric ramparts (IA and IB). 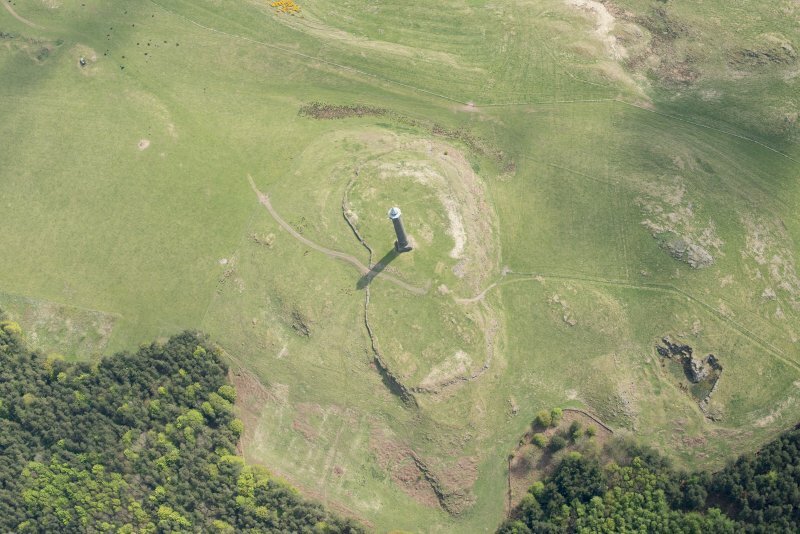 The NE half of the defences can still be traced on the flank of the ridge, and there is a well-defined entrance at the NE apex; but except for a short distance immediately W. of the gateway, where the inner rampart is represented by a mound of earth and stone up to 15ft thick at the base and 4ft 3in high, both ramparts are reduced to mere crest-lines. On the E side the crest-line of the outer rampart is interrupted at the point where it is crossed by the wall of the later fort, but reappears inside this wall across the neck of a rocky spur. 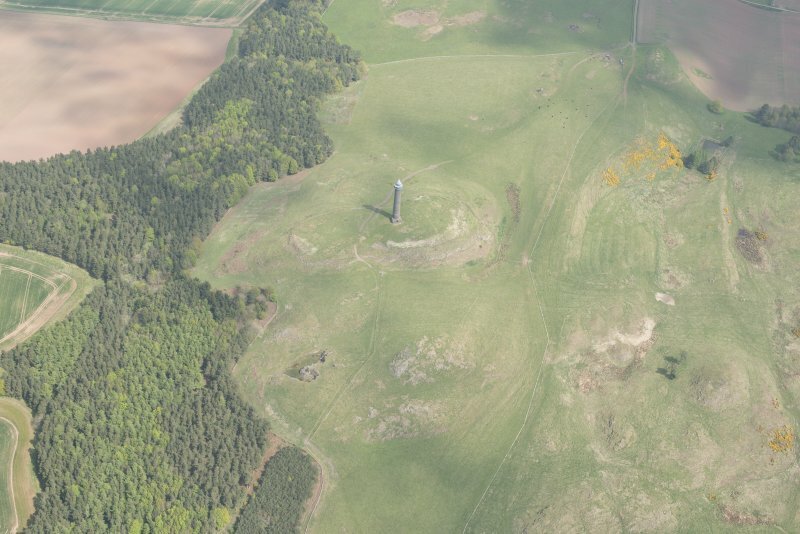 Similarly both crest-lines project into the later fort on the W side, and the outer rampart is prolonged in the form of a wasted mound as far as the centre of the ridge. 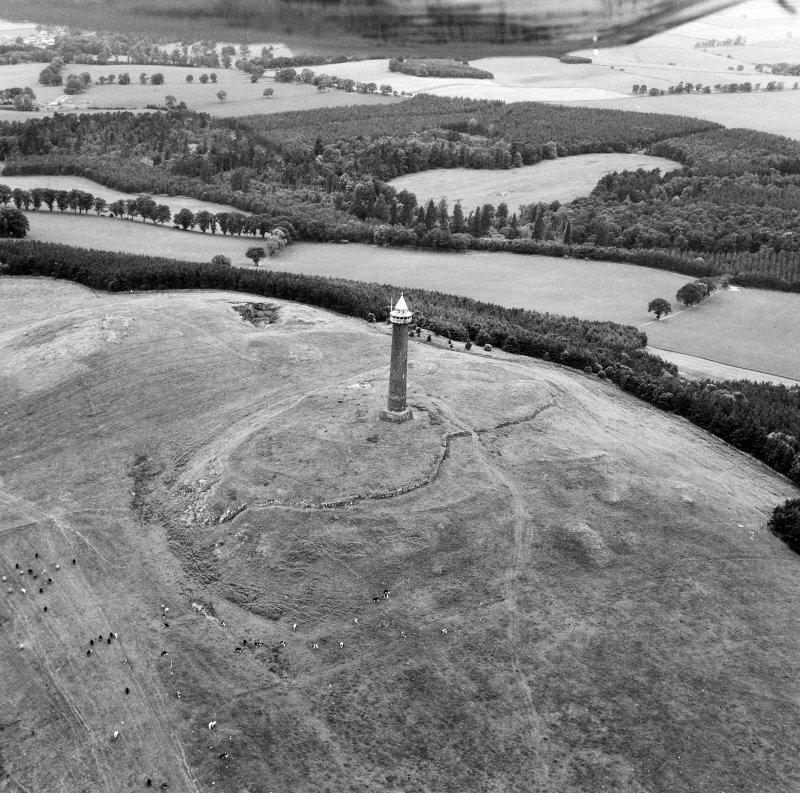 There is no sign of structures contemporary with this early fort either on the top of the ridge, which was raised and levelled by the dumping of masons' chippings when the tower was erected, or on the N flank. The later fort, one of the most interesting monu- ments in the county, is of completely different design and construction from its predecessor. 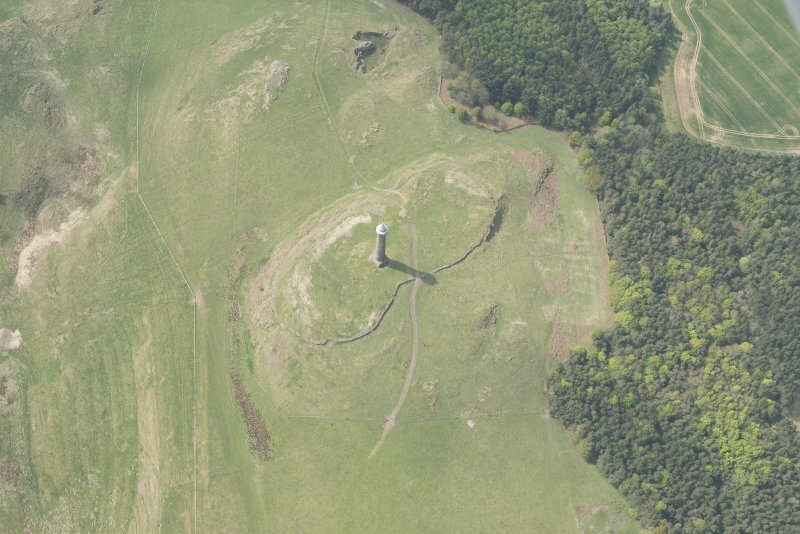 It consists of a single boulder-faced wall (II) which encloses the whole of the top of the ridge and, wherever possible, is sited on the edges of the rock outcrops which thus form an integral part of the defensive line. The relative chronology of the two forts is shown by the fact that, as already stated, this wall cuts across the line of the defences of the oval fort on the E, while there is no gap in it to match the NE entrance to the latter work, as must have been the case if the oval fort was the later of the two. The thickness of the wall is uncertain since the inner face is nowhere visible at the present time, but the outer face is well preserved on the N side, where the debris covering it has been systematically removed at no very distant date, at the SW angle, and on either side of the track that enters the fort from the S. It is composed of massive, irregularly spaced orthostats, up to 3ft 6in high, the intervals between them being packed with smaller boulders : wherever they are exposed, the foundations are seen to be laid directly on the rock below (see fig.89). 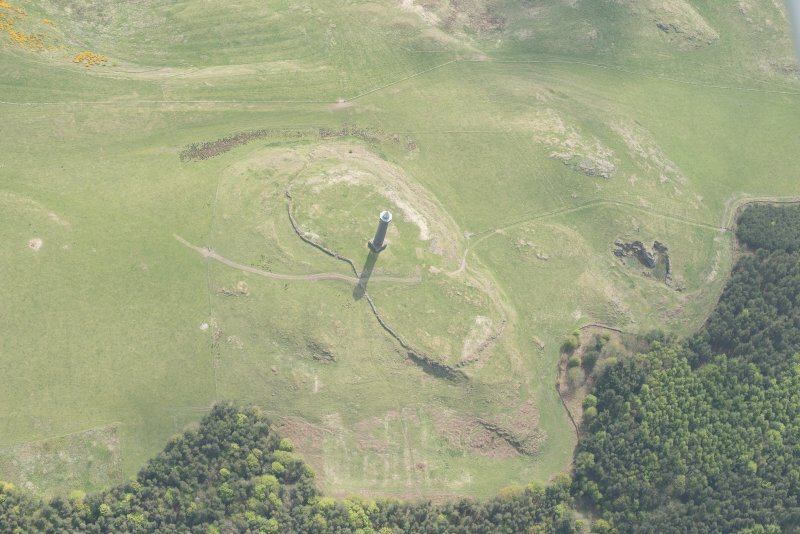 The maximum height of this face is 4ft 6in, but on the N and E sides it has been for the most part restored in modern times to a height of nearly 6ft. Other fortifications which may belong to this phase are a broad ditch, largely effaced by ploughing, at the base of the ridge on the S side ; and a stone-faced rubble wall (C), 8ft to 9ft thick, which encloses a semi-oval terrace 20ft below the top of the ridge at the W end. A gap in the S wall which overlooks a causeway across the ditch and is used by a modern cart-track almost certainly represents an original entrance; while the only possible site for a second entrance is in the centre of the N side, where a gap of 80ft in the fort wall is occupied by a modern wall and gateway. Within the fort no buildings can be traced, but a short length of outer facing-stones (D), situated near the centre of the ridge and parallel with its short axis, may be the remains of a dividing wall similar to that observed at the Dunion fort (RCAHMS 1956, no.33). On the other hand two fragmentary walls, one of which (E) lies at the W end of the ridge and is 10ft thick, while the other (F) can be traced intermittently by outer facing-stones along the E margin and part of the S margin of the summit area, appear to be unrelated to either of the two systems referred to above and to connote one or possible two more intermediate stages in the fortification of the site. The narrow walls (G) are ruined dykes of no great age. Although the site has not been excavated, and no chance discoveries have been recorded from it, the oval fort is of a familiar Early Iron Age pattern ; while the later fort, which closely resembles the Dunion fort (RCAHMS 1956, no.33) on plan, is probably of sub- Roman date. 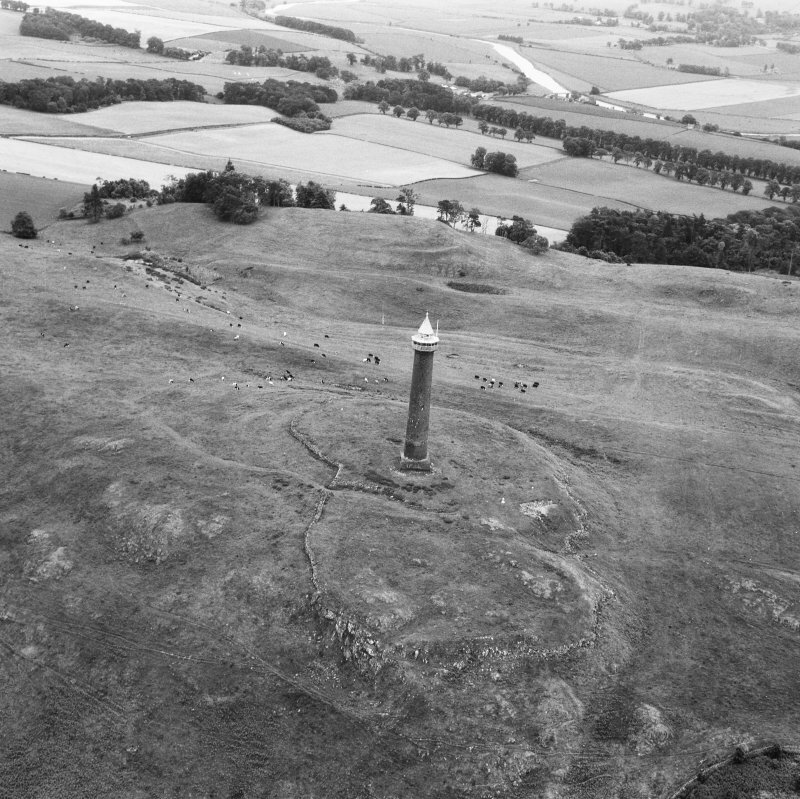 RCAHMS 1956, visited 26 July 1949. 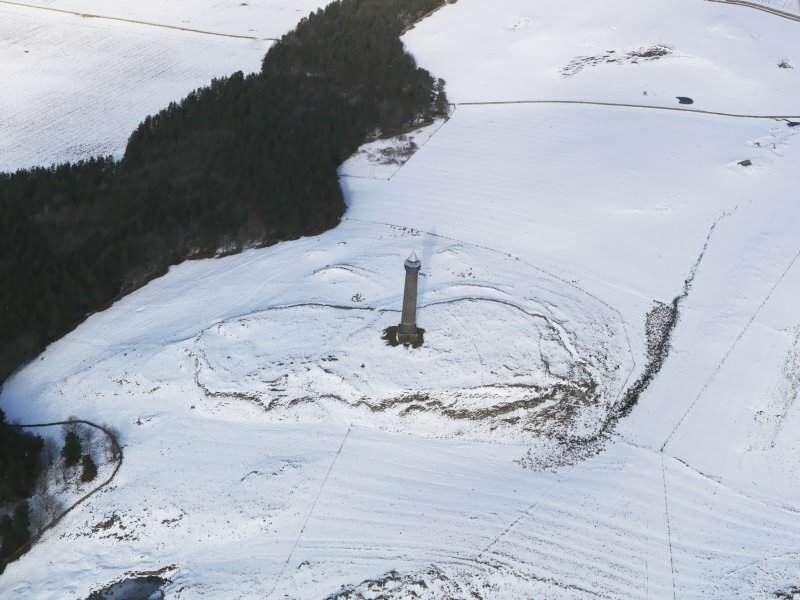 (a) No mention is made by the RCAHMS of the grass-covered stony bank (0.6m high) which skirts (externally) the north and east sides of the enclosing wall of the later fort. (b) There is little evidence of the causeway over the ditch at the south entrance; the counterscarp of the ditch is clearly evident where it is crossed by the modern track. Visited by OS(WDJ) 9 December 1963. NT 653 263 Flint found on a molehill and identified by A Saville (NMS) as a distal segment of an Mesolithic edge-blunted 'backed' blade. Claimed as Treasure Trove and allocated to NMS. 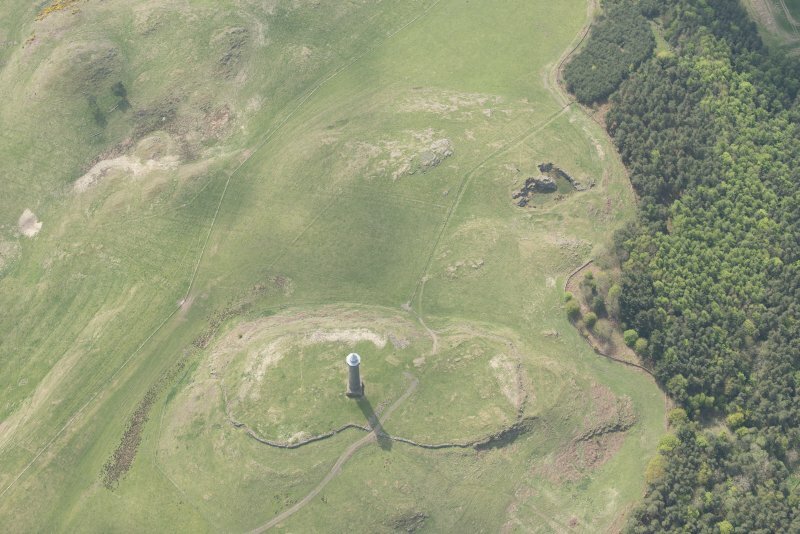 A complex sequence of fortifications can be seen on the summit of Peniel Heugh, a well-known landmark crowned by a tower built to commemorate the Battle of Waterloo. 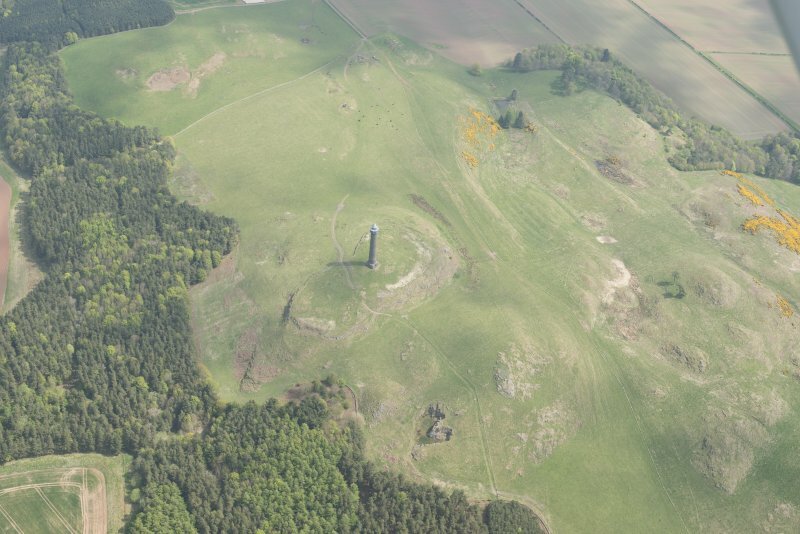 The earliest is probably a bivallate work occupying the higher part of the summit on the E, while the latest comprises a single wall taking in the whole of the summit area. This latter wall incorporates a series of massive stones up to 1m high set up on end in its outer face; these can be seen along the N side, where the rubbles has been pulled back and the face has also been rebuilt to a height of up to 1.8m. Roughly oval on plan, this latest fort measures about 175m from WNW to ESE by a maximum of 75m transversely (1.1ha). On the E and S its wall follows the crags along the edge of the summit and a track that mounts the slope via a broad causeway in a ditch dug into the foot of the slope below them on the S is probably reusing an original entrance; the gateway in a rebuilt length of wall on the opposite side of the fort on the N may mark a second. While this fort is clearly set out eccentrically across the earliest fort, it is evidently not the first fortification to have taken this line. At the far WNW end, above a small D-shaped annexe taking in a lower terrace, there are fragmentary remains of a wall extending along the crest of the slope. Its likely course has been adopted by the wall of the latest fort on the N, thus implying another enclosure of a similar size; its E end is perhaps represented by another fragmentary wall, which can be traced southwards from a curious re-entrant on the ENE where the latest fort wall has been re-aligned to drop down to the crag at this end. 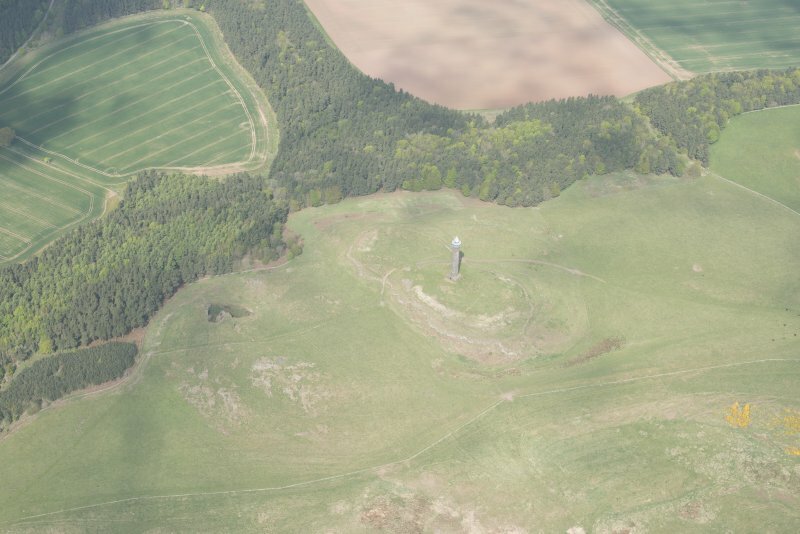 The defences of the earliest fort apparently contour round the E end of the summit, but the defences are only clearly visible outside the latest fort wall on the NE. 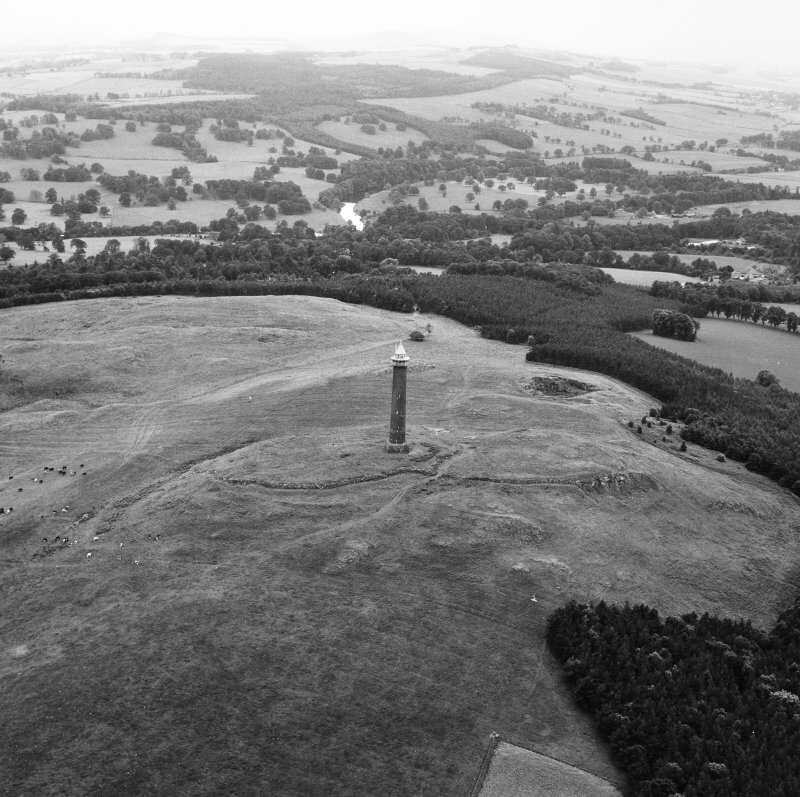 For the most part both ramparts have been reduced to no more that scarps, but on the NW side of an entrance preserved on the NE, the inner forms a bank 4.5m in thickness by up to 1.2m in height. The oval interior, which measures about 105m from NE to SW by 80m transversely (0.65ha), is traversed by a post-medieval field-bank and has probably been cultivated.